Copyright and Camera « "I do wander everywhere"
Unless otherwise stated, all photos posted to my blogs are mine. If you reblog one of my posts, make sure that you reference the blog from which it came. If you use a single picture, credit me with it: Bunty McCabe and the year the photo was taken. 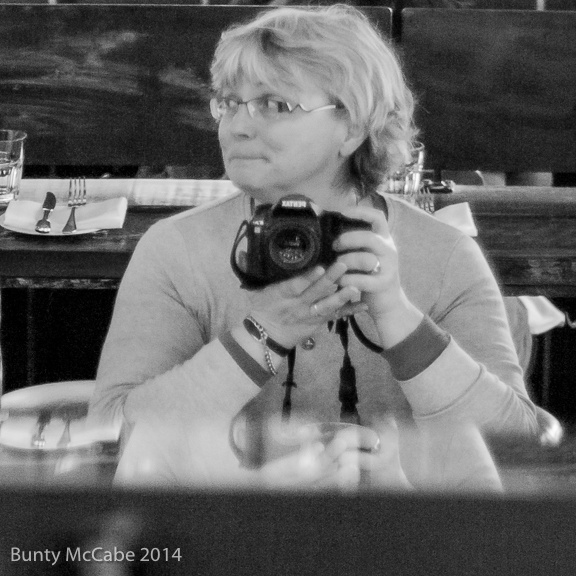 BuntyMcC self portrait with Pentax K20. My photos are shot with a Pentax K20D bought in 2008 (two weeks after my first grandchild was born). In September, 2014, I bought a Sony RX100III which is a full frame ‘point and shoot’ with a 24-70mm zoom. I’ve been using it a lot. In fact I have hardly used the Pentax at all since buying the Sony, mostly because I haven’t wanted to carry the Pentax when I’ve been on excursions. I shoot in RAW and process in Lightroom 5. I have not yet had the time or energy to learn to use Photoshop. Maybe you need to have your camera looked at by a good camera repair centre. Your Tamron 90mm macro lens is a great lens if you bought a good copy of one. It’s super sharp, produces delicious Bokeh, and makes a lovely portrait lens too. I don’t own it, but have used a friends. If I didn’t already have a macro lens I would have that Tamron on my short list. I’m enjoying your street work. I don’t do that type of photography very often. It’s way out of my comfort zone.